Discovering the God of the Universe together on August 14-18, at Ebenezer CRC in Jarvis. All Children ages 4-11 welcome! 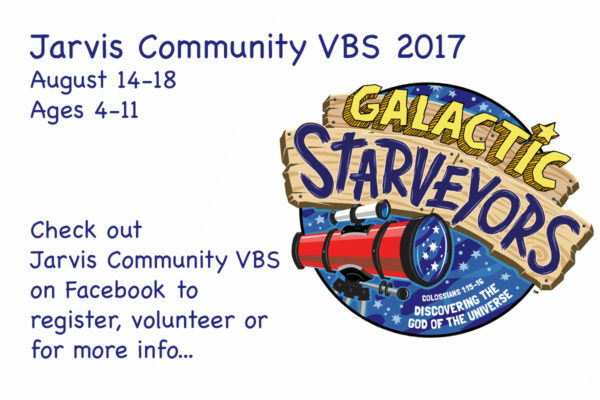 Visit the Jarvis Community VBS Facebook Page for more details. Forms available at Ebenezer CRC or register online HERE. We are searching for any & all volunteers (age 13+). Whether you enjoy music, acting, games, storytelling, leading, organizing, or whatever your strength is, we will find a place for you! We would love to have you! (Nursery will be available for your young children). We are especially looking for volunteers to man our sound-booth each morning – please consider if this is a spot where you can serve.